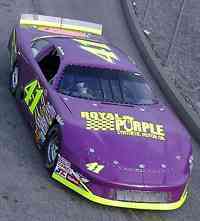 When it came to the Elite Series side of things at Irwindale, nobody made a bigger comeback than Rip Michels. The personable Western driver led the majority of laps early in the race, but got spun on lap 89 by Burney Lamar. With only 36 green flag laps to go, Michels almost made it back through the field. He came from the tail end of the lineup to finish sixth in front of a home crowd. J.R. Norris might have set a new record for misfortune at the Showdown when he finished in the 23rd position. Norris had possibly the fastest car in the event, but his #5 Richie Wauters-owned Southeast Series machine had the problem of getting caught in six different skirmishes during the race Whenever somebody spun or wrecked, it seemed that Norris was a car length or two behind it. 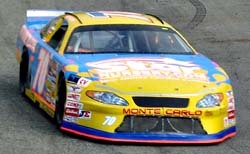 Unfortunately, the race at Irwindale was also typical of the luck which Norris has had throughout the 2005 season. knows the track well and this was his first time entered in the Showdown. Since the NASCAR Toyota All-Star Showdown is the largest event for the top guns of the NASCAR Elite divisions, you would expect that teams spend months and months preparing for the show. The annual event invites the top-ten drivers in standings from each of NASCAR’s Elite divisions. There is one event where that all can change, though. Lady luck wasn’t riding with Greg Purlsey this weekend either. 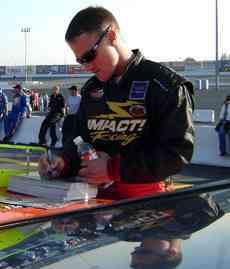 He led 49 ½ laps in his qualifying race on Friday night, but finished second at the line of the 50 lapper. That set the stage for getting caught in a big wreck on lap 37 of the feature that knocked him back to a finish of 36th. be nice if we could get more guys up there and do a little better. Second is pretty good news though. We didn’t really expect to beat the Southwest when we came here, so that’s kind of like a win. If they come out to Rockford and WIR, they’d have their hands full. We’re at their hometrack here. While some of the best short track drivers in the country were spinning and wrecking around him, Robert Richardson kept calm on the way to a strong 13th-place finish in the Showdown. Getting to the finish was not an easy task for Richardson. He struggled with the handling of his #33 MortgageDashboard.com car in his qualifying race on Friday night and started 35th in Saturday’s main event. Moving through the field was a challenge in a race with 13 caution periods over its 125-lap distance. finished 14th in the standings based on a strong first part of the season and received the invitation to the Showdown at the last minute when a few other teams declined. The #41 team didn’t miss a beat despite a tight timetable. The 125-lap feature race was especially grueling with 13 caution periods. Davidson stayed out of trouble, but ran in the top 10 for nearly the entire race, so his finish wasn’t unexpected. With the high level of competition out there, Davidson needed to get racy when the race neared its conclusion. The Elite Series feature was a rough race, but Eddie Hoffman survived to finish fourth. That was the best finish for all non-Southwest Series teams and it came as a result of Hoffman’s own “driver development” program early in his racing career. Hoffman had the best effort of the 10 Midwest Series teams at Irwindale. J.R. Norris signs some pre-race autographs. This year, Chris Davidson and his #41 Turner Motorsports team did not compete in the entire NASCAR Southeast Series. They were outside the top-10 in points so they figured they would not be invited. Yet, just a week before the prestigious events, they got the invitation in the form of a phone call. Then, in a span of eight days, they prepared for the race, hauled to California, practiced, qualified and competed in the event. It was a Herculean effort and it paid off. Davidson finished seventh, best among the ten Southeast Series competitors in a 40 car field made up of the best drivers from SES and NASCAR’s Southwest, Northwest and Midwest Series. Another problem was dodging those wrecks. Richardson was successful in doing so in all but one incident. After that, Richardson just had to make his way through the field again. When asked about avoiding the other accidents, Richardson didn’t even know where to begin. The top-15 finish was a success for the team when you take all of that into account.